I stumbled upon something called erowid.org forums. According to these people almost anything from absinthe to yoga can be abused. Grind up some caffeine pills, add ammonia, microwave the mixture – bam – freebase smokable caffeine. It’s a thing. Can you abuse blue cheese? Can you have a bad trip on chocolate? It’s crazy stuff. How Do You Like Them Apricots? Today I received in the mail a fresh shipment of coffee from Victrola Coffee. Inside, along with the coffee was a handwritten postcard, thanking me for buying their coffee and encouraging me to let them know what I think about it. I bought a pound of their house blend, Streamline Espresso ($13 /lb), as well as half pound packages of pricier special coffees, Colombia La Esperanza #1 Cup of Excellence ($18/lb) and Kenya AA Mtaro ($14/lb). If I had sufficient financial resources, I would buy coffee in half pound increments, on a weekly schedule, because coffee is only at its best for a few days after roasting. I would also buy a Synesso Cyncra and a Clover machine. Well, ok, enough dreaming, as what I have in terms of coffee and equipment right now is pretty damn good. Tasting wine, coffee and cigars is highly subjective, and gets rather ridiculous, just like judging audiophile equipment. I never know if I am so stupid and insensitive that I can’t detect all the subtleties that the real fanatics detect; or so stupid that I believe that generally vacuum tube amps sound more pleasant and that there are “notes” of different stuff in good coffee, wine and cigars. Starbucks has a huge variety of coffees. They all taste pretty much the same though, because they are over-roasted and under-extracted. 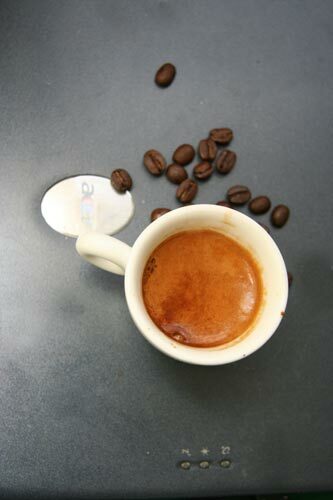 Espresso made from any of their beans has the same notes: hydrochloric acid, burnt coffee and donkey. Yet they go on and talk about notes of chocolate, toffee and oranges; conduct coffee tastings and train their employees to talk about it to the customers. Once you properly pull a shot of well roasted coffee that is also fresh, it does not have enough acid that would cover up the thousands of complex aromatic organic molecules that really confuse your taste buds. Your brain starts trying to assign familiar tastes to the weird electrical impulses generated by your taste buds. Without overpowering bitterness and burnt character, the playing field is leveled for these subtle and rather weird flavors. Coffee starts tasting the way freshly ground coffee smells. The beans of Colombia La Esperanza had a smell that I have not encountered in my life yet. It was similar to the way really expensive chocolate-covered dried apricot would smell, although that wasn’t it. It was something else. But if it were sold, it would come from an expensive store individually wrapped in tissue papers inside a well-made wooden box. Espresso made from the beans was amazingly tasty. The major taste element was that weird apricot smell which actually went away after a while, replaced by something very similar to an expensive white wine aftertaste. In short, some of the best espresso that I’ve had in a long while. And that apricot-like taste still haunts me. It’s a proven fact : bubbles make caffeinated beverages better. 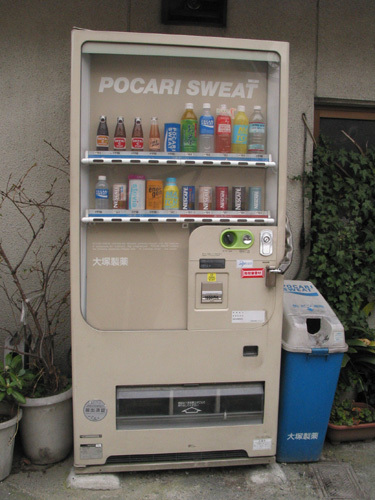 Take a crappy tonic drink from Thailand, add carbonation, introduce it in Europe and the US and bam – you are a billionaire. Introduce espresso (simplistically speaking a very concentrated coffee with a foam of sugars, proteins and oils on top) and cappuccinos (add foamed milk to an espresso) in America on industrial basis – and bam – you almost a billionaire. Seems like the next logical step is tea. You see, Japanese have this tea ceremony thing. Never being a big fan of tea, but being a Japanophile at heart, I always wanted to try that. Unfortunately to this day I haven’t, but I definitely tried some tea that is used in the ceremony. 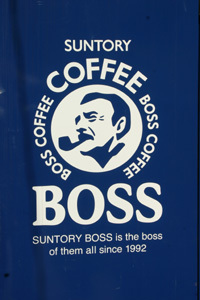 They were selling it in a booth in Kyoto alongside with ice cream. 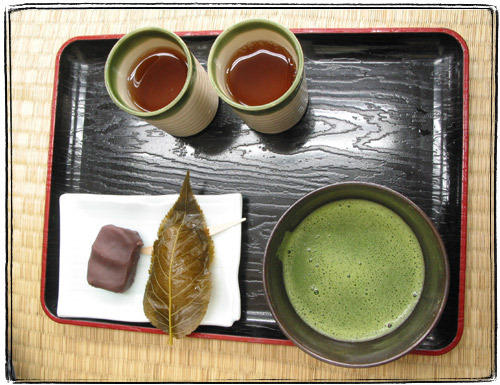 Japanese tea ceremony involves two kinds of tea, “thick” and “thin”. From what I understand the difference mainly in the dilution and the quality of tea. I like stronger flavors, like espresso and scotch, so I prefer to make thick tea. Making is very simple. 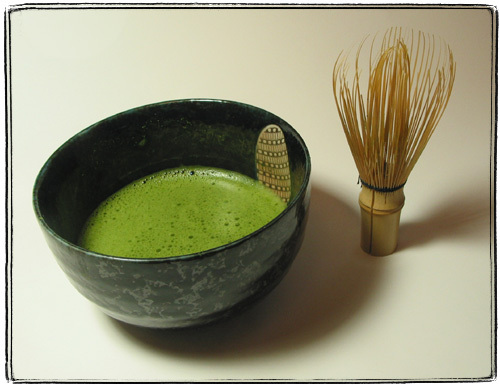 You take some high quality powdered tea called Matcha and put it into a bowl. You pour some hot water on top (I use the water from my espresso machine’s hot water spigot). Then you take a special whisk called chasen that is made by splitting a single piece of bamboo and whip your beverage up, kind of like making shaving lather with those old fashined shaving whisks. 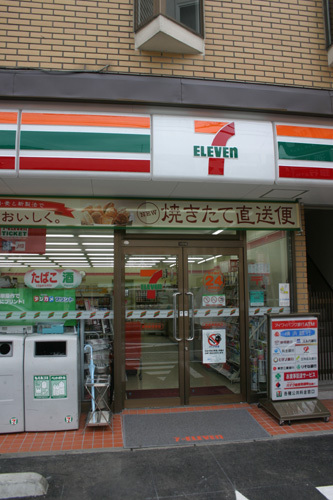 You get a radioactive green liquid that is absolutely loaded with green tea flavor, caffeine and and antioxidants. I already went through a package of medium cheaper Matcha, I think I’ll order some of the higher quality stuff as well. Here’s how Matcha is served in Japan, with regular tea and sweets. The one on the right is wrapped in a pickled leaf of sakura. I’ve made coffee in almost every which way, except percolated. I also never owned a percolator. Alt.coffee news group FAQ which I always regarded as the highest authority in all things caffeinated, seriously disses the French-invented percolator. On the other hand, people who actually drank percolated coffee usually have good things to say about it. Because of that I think I’ll hunt for a nice percolator specimen on eBay. A glorious Art Deco instrument in chrome and Bakelite. Even if I won’t like it’s coffee making characteristics, it will remain in my collection as a sculpture. (This particular auction seems to be reflectoporn free. 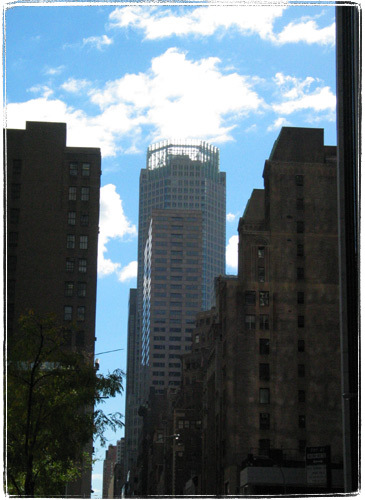 There is something that can not be captured in a hastily taken photograph in how Bear Stearns World Headquarters Building shines, with it’s glass crown sucking up clouds, amongst dark art deco buildings of the Jewelry District, when already late, sleepy and caffeine deprived I drag myself to work, on the way to the door handle that will give me a static shock and my noisy cubicle. I also can’t take a decent picture of the building’s crown when it lights up at night. Joseph Ainslee Bear and Robert B. Stearns must have been superhuman to build a company that occupies a building like that. At leas their names are pretty cool. I wonder what “B” stands for. Another Post from cubicle filled corridors of the Newscorp Building. 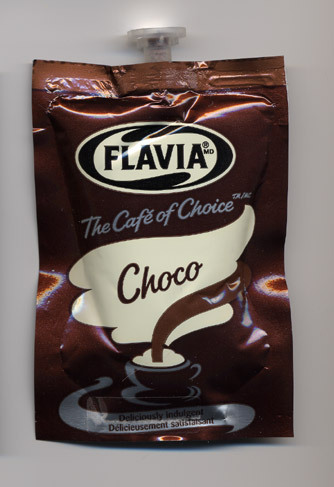 We tender this premium coffee for your enjoyment as a tribute to your good taste. It comes from the deadprogrammer’s collection to you 33. I new there was something weird in that coffee. “Milds”! What the hell are “milds”? Judging by taste it is probably tobacco. Or dried dog crap. 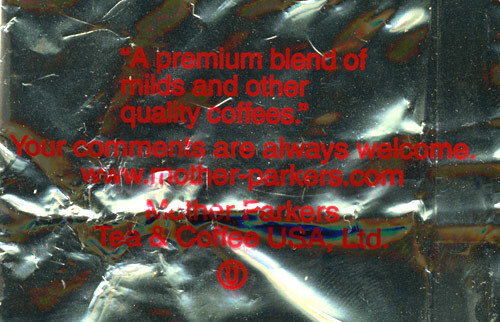 But then, what else what did I expect from a company called “Mother-Parkers”? Hey, these motherparkers even have a website. There is an OU symbol on the package. Milds must be kosher.